Just in case there was the slightest outside chance that we might find ourselves with spare time on our hands, we’re currently converting Real Tenerife Island Drives into Kindle format. We’ve watched with interest over the past year as Kindle has taken off, and having just bought one as a present for someone and seen it in action, it’s clear why this little gizmo will soon replace paper-bound holiday reading. 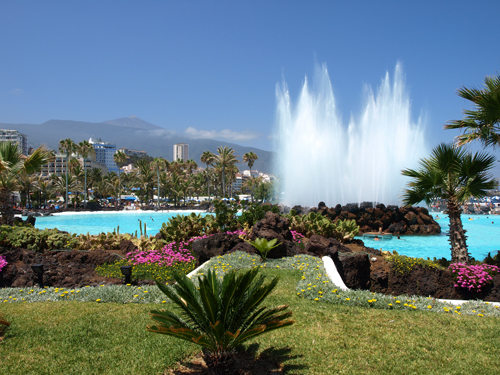 So, never one to miss an opportunity, I have embarked on making Real Tenerife Island Drives available on Kindle, which gives us an opportunity to ensure that all our directions and references are fully up to date. If you’ve just flown back from Tenerife’s palm-filled paradise, of course you’re going to be miserable when you get back to the cold weather, daily grindstone and concrete of home. But as the excellent Pamela pointed out, there are ways to prolong the benefits and defer the misery. If all you do while you’re on vacation is lie around a pool or on the beach developing a nice, even tan, then let’s be honest, the holiday’s over the moment you set off for the airport. After all, what are you going to tell people when you get back? “Hi – how was the holiday?” they’ll ask. If, on the other hand, you get out and about exploring, discovering tucked away gems of places, charismatic restaurants that turned up the best tapas you’ve ever tasted and scenery that’s even had the kids going “WOW!” you’ll have a whole store of adventures and tales to tell. You can relish, embellish and re-tell experiences endlessly, re-igniting memories and bringing that holiday smile right back! Leaving your comfort zone and experiencing something different can open the door to a whole new world of adventure. 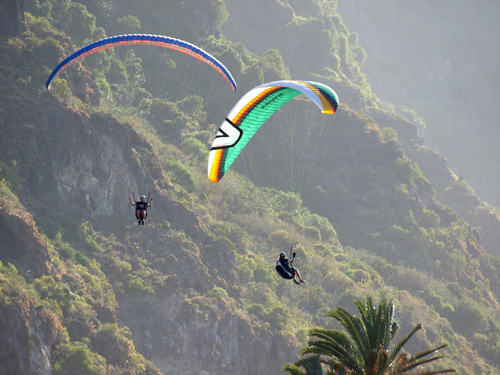 Why not try your hand at diving around the beautiful waters off Las Galletas, or try a tandem paraglide in Adeje or bike rafting down from Teide National Park? You never know, it might spark a latent talent or a passion that’ll have you embarking on a whole new way of life after you get back home! 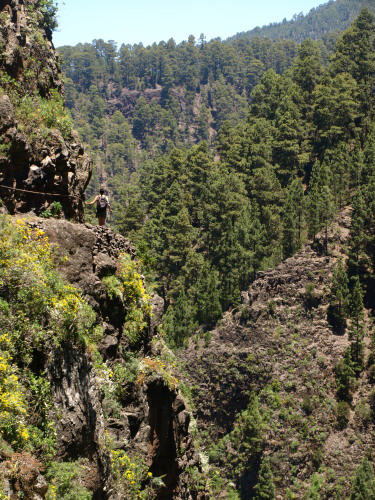 If the office sends your stress-ometer off the chart, walk it right out of your system by taking to some of Tenerife’s amazing hiking trails. Walking is a great way to relax your mind and tone your muscles while experiencing parts of the island that most visitors never get to see. Your body will feel more refreshed, your mind will be more alert and you’ll be better equipped to keep the stress bar down when the in-tray rises. Island Walks and Island Drives – for holidays that last longer than the tan! I know it’s a bit sad to blog about a car park and if you live in London or LA or New York and consider what I am describing to be practically archaic nowadays, cut me some slack. I live on Tenerife and finding anything here that works this efficiently just has to be recorded. Please feel free to skip to the next entry. It’s not the first time I’ve used the shiny new car park beneath the bus station in Santa Cruz, and it certainly won’t be the last. Apart from its rather odd entrance whereby you drive over the pavement, avoiding maiming pedestrians if at all possible, everything else about this car park is sublime. To begin with they have this coating on the floor which makes your tyres sound like you’re in the car chase scene from the latest Bond movie. Then they have this excellent lighting system which has a green light above each vacant parking space and a red light above each occupied one so you can see at a glance where the empty spaces are. And as if that wasn’t simplicity itself, at the end of each row they have a sign which either flashes a red ‘X’ to indicate there are no vacant spaces on that row, or a green number to indicate the number of empty spaces there are. Ha! You just find and drive into a space as if by magic. And the cherry on the cake? Well this is a capital city parking lot and this week I parked there for almost four hours mid-morning on a week day. In Manchester that would have cost me the best part of a tenner, instead it was €2.85! The queue’s eerily quiet beneath its blanket of nervous anticipation. Some are sitting in their cars, flicking distractedly through newspapers, others are standing beside their vehicles shuffling their feet or examining their bitten nails. I’ve never witnessed a silent gathering of Tinerfeños before where everyone keeps their own company and just waits. It’s an aberration and it runs completely contrary to their normally gregarious and noisy nature. The next two cars in the queue drive forward into the hanger-sized garage and out of view. I switch on the ignition and slowly drive forward, just three cars away from the unknown. I haven’t been this nervous behind the wheel since I took my driving test and no sooner has that thought entered my brain than it travels down into my right leg which responds by emulating the same state it was in all those years ago and judders onto the pedal sending the car kangaroo-ing forward and narrowly avoiding bumping into the car in front. I’m in the queue for the Spanish equivalent of the MOT test; the ITV. Unlike in Britain where I’d hand over the keys to some mechanic and then dawdle around the shops for a couple of hours before returning to a verdict and usually a bill, here the ITV is performed in only a handful of centres across the island and you have to drive the car through a series of tests and checks at the end of which you either receive a little coloured dot for your windscreen or with an instruction to carry out the necessary work within 15 days to make the grade. “Freno! Luz! Izquierda! Derecha!” shouts the man with the clipboard from behind the car. As usual my Spanish understanding is on a satellite system with a few seconds delay between receiving in ears and translating in brain which causes a sort of Lee Evans effect in my movements. The wipers are going and I’m revving madly as the man repeats “Freno! Freno!” before my brain remembers that the brake pedal’s the middle one. After the lights fiasco I settle down a bit and take the car through its various tests and emerge at the end in confident expectation of the little coloured sticker. “Two new front tyres” says the man with the clipboard, “15 days”. “What! ?” I get out of the car onto wobbly legs and look at the front tyres where the tread used to be. I can’t believe it. I’ve topped up the oil and the engine coolant, washed polished and vacuumed inside and out and not once have I looked at the tyres before joining that silent queue. What’s worse, not once have I looked at them before driving around this island on the equivalent of Michael Stipe’s head. As I head off to the local garage for two new tyres, I realise I’ve just been through the most efficient system I’ve ever encountered on Tenerife where, in the space of the 40 minutes I was there, sixteen cars were rigorously tested against a set of standard criteria and passed or failed accordingly with no fuss, no vested interests and no ambiguity. No wonder everyone in that queue was so quiet, it’s an alien environment for a Tinerfeño. The other day I was driving up to La Caldera, in the pine forest in the upper Orotava valley in a queue of painfully slow moving traffic. I’ve learnt over the last four years that when there’s a queue, just to chill out and enjoy the scenery and within a few minutes the reason will soon be revealed. It’s usually banana trucks, but in the past I’ve also had carts pulled by oxen, cycle races and even an ostrich in the back of a horse box slow my progress. In this case the culprit was something that looked like a cross between an ‘Easy Rider’ chopper and a lawnmower (with the power of the latter). 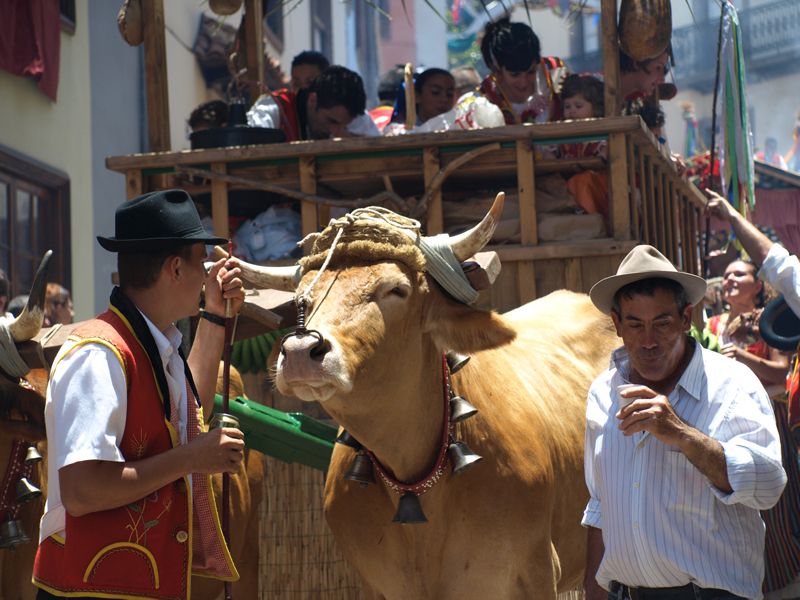 These contraptions are quite common in the hills, usually pulling a small trailer full of corn or potatoes. This one eventually pulled into a dirt track beside a small thatched hut and an old woman wearing a straw hat carefully climbed off, turned and gave her husband a gentle kiss on his weather beaten cheek. It was nothing spectacular, but this simple affectionate gesture moved me and made me smile. 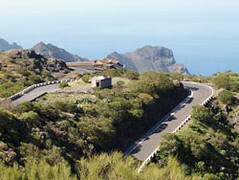 It’s little things like this that encapsulate the pleasure of driving on Tenerife’s roads. 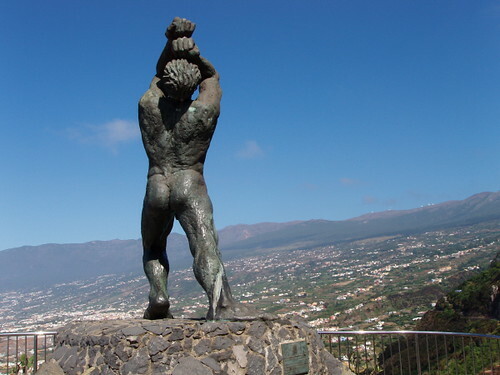 From the first time I rented a car on Tenerife, I was smitten by the diversity of the landscape. I can remember clearly driving from the west coast to the north and being almost able to see the line where the drier southern parts of the island met the more lush northern parts with Mount Teide dominating the skyline. It was breathtaking and I’ve never tired of it.